Book-A-Day #116 (11/9): Brevity by "Guy and Rodd"
The layout and design is notably good; I hope it doesn't sound condescending when I say I didn't expect this level of design from MonkeyBrain (this is their first full-4C book, right?) This looks as professional and eye-catching as anybody's art book, and better than many. 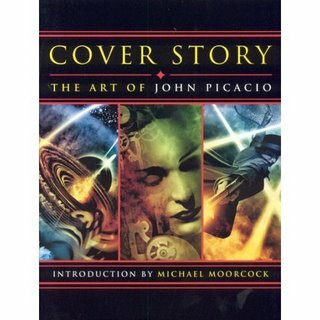 This book is chock-full of images that I hadn't realized were by Picacio; they were excellent covers for their particular books, and I hadn't thought about them any more than that. That's a good thing for an illustrator -- some works do pop out at you and demand attention, but the quieter covers that just do their job consistently are even more important. If you have any interest at all in SFF art, you should own this book; Picacio is going to be one of our major illustrators of the 21st century, and this is a thoughtful retrospective of his career so far. It was MonkeyBrain's first official 4C book, yes, but they did the Making of Sin City under another banner - a lavish book that was a hell of a lot better than the material it drew from!